Appearance: A few physical traits to be mentioned that the picture cannot distinguish are; First off, he has golden eyes. His skin tone is deathly pale and his muscle tone is defined, but not ripped, keeping his slender appearance. His mask fragment is located on his ears, in the form of stark white earrings. These earrings have two bead-like spheres leading down to a crescent shape. Also, his rank tattoo is placed on the inside of his right wrist, the number engraved is "37". When Tokuchi is not wearing the red undershirt with the black overcoat as seen in the picture, he wears a white long sleeve button-up shirt. During which time, he is decorated with a golden necklace, paired with a golden ring on the ring finger of his right hand. Finally, between the shoulder and shoulder blade on the right side of his back, a tattoo of a triquetra is apparent. Upon closer inspection, it would seem as though the tattooed skin is raised ever so slightly, resembling scar tissue. Personality: Tokuchi is likely be one of the most calculating, intelligent, deceptive, and cunning individuals ever to walk this world, or Hueco Mundo. Tokuchi is quite the pacifist, preferring to have a quiet conversation with the enemy as opposed to beating the lights out of each other. He is the type of person who never engages in battle unless he has assessed the situation and plotted several ways to overcome whatever obstacle may be facing him. Some mistake this for cowardice and yet, Tokuchi isn't one to fear anything, after all, ignorance is the curse of pride. Towards his peers, Tokuchi is a bit cheeky and speaks with disregard towards the consequences. However, towards his superiors, Tokuchi has much respect for them and wouldn't think to cross them unless he knew for a fact it would be beneficial. Towards humans Tokuchi has no extraordinary feelings of hatred, malice, love, or care. Special Characteristics: Tokuchi has a great knack for gambling. His talent began building while he was still a young human. His psychological prowess allows him the edge in most gambling situations. History: Tokuchi was born a single child into a wealthy family; his mother was a teacher at a college of average prestige, and his father was a psychologist. Not much can be said about Tokuchi's childhood as he was a fairly normal boy, side from his oddly spiked blond hair that was rather unbecoming of someone who was Japanese. Tokuchi was born and raised in the suburbs despite the fact that his parents were wealthy. Also, unlike others of his stature, he went to public school as opposed to private. Mostly due to the fact that his father thought constant human interaction was key. Growing up through elementary Tokuchi had excellent grades, he was crowned with a handful of "Student of the Year" awards even. While Tokuchi had friends during his school years he never really made any real effort to participate in social outlets such as sports, birthdays, etc. He was even content with a quiet night and a small cake on his birthday. As time went by and Tokuchi matured into junior high, many abnormalities began occurring, each more strange and out of place than the last. It all seemed to start one day when Tokuchi began seeing ghostly apparitions. As time passed, the ghostly figures seemed to solidify, Tokuchi never really spoke of this new sixth sense. He figured he had some type of insanity and just kept it to himself. It didn't really occur to Tokuchi that what he was seeing was in fact real until one day, one of his close friends was caught up in a car accident which proved fatal for him. Several days later, after the proverbial 'dust' had settled and he had come to accept the fate of his friend, Tokuchi decided not to go to school. Instead, he took the day and walked to the deceased friends' last place of residence. Upon arrival, Tokuchi was baffled by what he found. He saw as plain as day, the soul of his friend. He couldn't help but strike up a conversation. After speaking with the severed soul, Tokuchi finally understood he had no illness, instead it was a gift. As time passed, Tokuchi saw his friend less and less until eventually he stopped going entirely, it was difficult for Tokuchi to sustain a relationship with the dearly departed. A few weeks after Tokuchi had stopped visiting his friend, his father came home one day with a bird cage, inside it was what seemed to be an albino bat with weird markings and designs on its' face. When Tokuchi inquired about the new addition to the home, his father explained that he found it around the house of someone Tokuchi once knew. As the years passed and Tokuchi moved on to high school he became more aware of his powers, now on occasion he'd bear witness to hollow attacks. These hollows somehow were oblivious to his spiritual power and would often pass by him without offering so much as a second glance. Seeing these new beings wasn't the only thing his growing powers provided him, he had become a seemingly feeble human being. Prone to horribly painful migraines, sudden fevers, and cold sweats, Tokuchi's body was having trouble sustaining its' form with all the reiatsu it had stored. Around this time, other changes were taking place in Tokuchi's life. His family had moved from a suburban area to owning their own estate. In school, Tokuchi's grades began to decline slightly, still he managed to stay at the top of his class. Though Tokuchi had a reason for the lowered grades. His usual time spent studying was now put towards a terrible hobby; gambling. The sum of money and/or possessions lost and won in this small gambling crowd were not for the faint of heart. In a single night one could lose everything they own. Tokuchi, however, had a knack for the game. The teachings of his father were passed on to him, Tokuchi was able to spot a bluff with ease during the card game he frequented, making it next to impossible for him to be beaten. On a good night Tokuchi would come home with an extra 500,000 yen and no one would be the wiser. Promptly after finishing high school, Tokuchi moved out and away from his parents, not wanting them to have to support him in any way. With his leave he took all of his belongings, the albino bat, and all of his earnings from his gambling. This money was more than enough for him to buy an apartment and even an expensive sports vehicle, which Tokuchi did. After a few weeks of solitude he decided to apply for a college, though not the one his mother happened to teach at. Tokuchi also returned to gambling, though he now visited casino's and played for even larger sums of money. His winnings provided him with enough to support himself without the need for a job. As Tokuchi progressed through college life, the issues his body was having as a byproduct of his powers seemed to subside. Instead, once too much reiatsu had built up inside of his body, he now had the ability to release it in the form of a blast via his hands. He found himself having to do this once or twice a day to counter the effects that would eventually kill him had he not done so. Hollows appeared more frequently and Tokuchi even began seeing humanly figures in strange robes. At first, he assumed them to be mere souls, but the more he witnessed them, the more he noticed their own reiatsu levels, almost always being much higher than his own. They were always seen dispatching hollows and stepping into a gate made from thin air afterward, disappearing along with it. Tokuchi had been in college for several years now, and his powers had finally completely developed, Hollow attacks were plentiful now, and it seemed as if some of them were even attacking him. The simple truth of the matter though, was that his power fluctuated, his reiatsu provoked many of these hollows but by the time they made it to the human realm, the power seemed to had dissipated. One day, Tokuchi decided to take a little stroll through the town he resided in, making his way to the park for a day of rest and relaxation. Upon arrival, the empty park was a sight to behold, as it was normally filled with children and their parents. After surveying the entire park, Tokuchi looked to the sky to find that there was an expanding black hole, and emerging from it was a Hollow. Looking around once more Tokuchi also noticed that no Shinigami were present this time. After the Hollow had stepped out of the portal it looked down to find Tokuchi, staring right back. 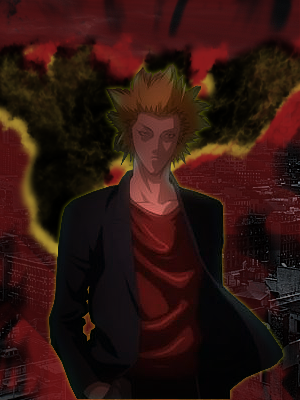 Tokuchi had about enough of the Hollows, today he would put an end to it; without the interference of a Shinigami. As the Hollow lunged downwards at Tokuchi, who responded by lifting his arm in the direction of the Hollow, firing a large blast of blue reiatsu... The fight went on for some time until finally Tokuchi managed to slip behind the Hollow and fire off a blast of reiatsu at point blank range. Just as he did so, he caught a glimpse of a Shinigami in the corner of his eye, on a rooftop not too far from the battle. The Hollow vanished after the blow to the head and the Shinigami simply opened yet another one of those gates that they were so fond of. This time however, Tokuchi rushed over and leaped atop the roof, swiftly entering the portal before it closed. After stepping into the portal, Tokuchi scanned his surroundings, finding a wall of a strange purple substance on either side of him and a straight pathway forward. Tokuchi followed this path for some time until eventually he spotted a butterfly that was going in the same direction as he. Tokuchi decided to follow the butterfly and after almost a half hour of walking, there was a gate at the end of the tunnel that opened when approached. Tokuchi stepped through the gate to find he was now in the middle of a grand establishment; Seireitei. It wasn't long before sirens were blaring and the sounds of thousands of Shinigami scurrying towards him filled his ears. Knowing there would be absolutely no benefit to running or trying to fight back, Tokuchi simply stood still and held his arms up in surrender as they surrounded him, all of them pointing their Zanpakuto's at him, ready to strike if he made the slightest movement. Just then, a voice called out ordering the horde of Shinigami to stand down, all of them recognized the authority and did just that, sheathing their Zanpakuto's and clearing a path for the one who spoke out. It was the one who Tokuchi saw earlier on the rooftop. After some explaining on the part of Tokuchi as to how the human arrived at Seireitei he was placed in a holding cell. He would stay there until two days later when his fate had been decided. The man whom he followed to get to the Seireitei arrived at his cell with the verdict; work for them as a Substitute Shinigami or stay in prison for a decade before being released back to the human realm. It really wasn't a hard choice for Tokuchi. He agreed to work for the Gotei for however long they desired his services in exchange for freedom. Before beginning his new life as a Substitute Shinigami, Tokuchi underwent several months of training in Seireitei, his tutor was the one who saved him from an eternity-long prison sentence. This Shinigami's name was Souseiki Ketsubou. He was the Third Seat to the Tenth Division at the time and also directly responsible for the actions of his new pupil. Tokuchi's training mostly involved academics, an understanding of what Hollows and Shinigami were to the balance of the three dimensions. After the academical training came the physical training. This took merely two weeks of constant sparring and training exercises before Tokuchi was approaching the level of tactical prowess as Souseiki. Finally, with the training nearing completion, the Scientific Department developed a way to imbue the purification powers of the Zanpakuto into Tokuchi's reiatsu. Once this task had been completed, Tokuchi was gifted a small stone tablet with a skull engraved on it. It was in fact a Substitute Shinigami's badge. Its' purpose was to alert when there were nearby Hollows, and as an added effect it was able to transmit orders from the Gotei hierarchy. The last purpose it held was to open gates between Seireitei and the human world. Tokuchi also found that he could use it for travel around the human world as well. With his training complete and his certification awarded to him, Tokuchi ventured back to the human realm for some much needed recuperation. Months passed and with his duties bearing down on him, Tokuchi sought an outlet for his stress and turned to smoking, needing to find some way to escape the pressure of gambling, college life, and now Substitute Shinigami responsibilities. Time passed and Tokuchi's powers slowly grew over time, he could now dispatch a Hollow in a few moments as opposed to his first kill, which took him the better half of an hour. He had spoken with Souseiki not too many days ago and it sounded as if Central 46 was pleased with how Tokuchi had been handling his duties, it wouldn't be long before he became a free man again. Little did Tokuchi know that he would never return to just a simple human being, as a matter of fact his human life was nearing completion. On a day like any other, Tokuchi had finished a day at college and began to head to the casino to relax and perhaps earn a small fortune. Unfortunately his expectations were short lived when his Substitute Shinigami badge began to release a hellish crackling noise, followed by a voice which demanded that he make his way to Karakura Town. The situation was explained that someone had used Hollow bait which was attracting abnormal amounts of Hollows. Thus, Tokuchi opened a gate to Karakura and made his way to the distant town. Upon arrival, Tokuchi was greeted with the threat he was sent to eliminate, in the form of three low-class Hollows, eradicating the group with three simple blasts of highly concentrated reiatsu. The fight continued on for some time, the Hollows seemed endless, until somewhere off in the distance a gigantic hole tore through the sky and out came a Menos Grande. Tokuchi attempted to make his way over to the scene, hopping along the rooftops towards the gigantic beast of a Hollow. Just when it would look as if he was closing in on the target another hole appeared directly in front of him, though it wasn't as large. What stepped out of it though, was something much more powerful than the Menos Grande. It was an Adjuchas, and a highly developed one at that. The Adjuchas shared a strong resemblance to a raptor, which was all Tokuchi could depict before attempting to strike it down. Tokuchi's efforts were in vain however, as the Adjuchas easily outmaneuvered him. It wasn't long before the Adjuchas delivered a fatal blow to Tokuchi's midsection, nearly severing him in two. As Tokuchi fell to the ground, he managed to mutter "What the... hell are you..?" before losing consciousness, and his life. Tokuchi awoke to find that he had been chained to the rooftop where he died. Scanning the area, he came to the conclusion that he was a demi-Hollow. Tokuchi wasn't sure how long he'd been unconscious, but the Hollow hole in his stomach and the fact that the chain attached to his chest was down to the last two links were a good indication that he had been out of it for at least weeks, if not months. Surprised no one had arrived to cleanse his soul yet, Tokuchi simply laid in wait as the final two links to his chain were eaten, completing the Hollowfication process. The first thing that began to happen was Tokuchi's body dispersed, freeing him from his confines. He reformed moments later where he was once bound, his skin now pitch black and wings spanning from his wrists to his ribs. The next thing to happen was that Tokuchi began to spew a white liquid that coiled around his face and head, solidifying and forming a Hollow mask. The next few moments that passed were that of dead silence, Tokuchi inspected his new form, intrigued more than anything else. Then it hit him, his hunger for souls came rushing through him like a tsunami. Several hours after the transformation, Souseiki made his way to Karakura, attempting to cleanse Tokuchi's spirit. Though once the two stumbled upon each other there were few words. The forces clashed and Tokuchi would be victorious. He devoured the soul of his tutor, leaving him with some choice words; "Thank you for this wonderful gift.." Though unlike the Adjuchas that assaulted him, Tokuchi finished the job and consumed Souseiki completely. Wasting little time Tokuchi moved on to his next target, making his way out of Karakura via garganta. Tokuchi suffered weeks of constant hunger. He fed on any soul he could find, occasionally a Shinigami would fall victim to him. More and more time passed and the souls of humans became insufficient amounts of spirit energy. When humans simply weren't enough to sate the growing hunger of Tokuchi, he fled to Hueco Mundo and marked his arrival by mercilessly killing and absorbing the first Hollow he saw before making his way to the Menos Forest. He was drawn to that place, feeling reiatsu practically seeping out of it, he would find his next meal there. As he entered the petrified forest, cries of Hollows and Menos Grande alike filled his ears, screams of torment and suffering coursed through the forest like a strong current. Tokuchi finally felt at home. Wasting little time he sprinted through the forest, avoiding the Menos and looking for his next target. What he found was a mass of Hollows fighting each other to the death.. A perfect opportunity had revealed itself and Tokuchi entered the fray via air and would go on to on to fight until all the Hollows involved were frozen in place and drawn together, creating a Gillian class Menos Grande. Usually this would be a mindless beast until closer to the evolution of an Adjuchas, but the superior powers that Tokuchi possessed, both spiritually and mentally, allowed him to rise to power almost immediately in this new body. Tokuchi swiftly stormed through the forest of the Menos, now an equal among the giants he assaulted every single one he saw, utilizing his new found power that was known as "Cero" to weaken the Menos greatly before consuming it. This was standard practice for Tokuchi for several days. His ruthlessness granted him a very short Gillian stage as he began to evolve into an Adjuchas. His massive body began to shrink, now only slightly bigger than when he was a Hollow. Again, his wings extended from his wrists to his ribs, his mask was replaced with a helmet-like covering and Tokuchi was granted a unique ability, his reiatsu resonated and he could hear the thoughts of those around him. This proved to be an invaluable ally as it easily allowed him to land a preemptive attack on other Hollows and Adjuchas. Along Tokuchi's quest for power, he came along the Arrancar known as Zommari Rureaux, Tokuchi being a bit naive attempted to kill Zommari and consume him. While it was commendable that Tokuchi had the first strike on the Arrancar, he quickly fell to him. Before dealing the final blow, Zommari offered to spare Tokuchi's life and even train him to grow stronger if he devoted it to serving Aizen. At this point it wasn't a choice he could make, it was an ultimatum, so Tokuchi gladly accepted. Afterward, Zommari explained who Aizen and the Espada were, Zommari revealed to Tokuchi that he was the Septimo Espada. Tokuchi was accepted as a Fraccion under Zommari's wing and Zommari invested much time into training Tokuchi. When not with Zommari, Tokuchi was out devouring more souls, hoping to reach the nearly unattainable Vasto Lorde rank. Months passed and it seemed as though the Vasto Lorde status that Tokuchi craved was even farther than before, though it was simply the hopelessness of it all sinking in. As time went on, Zommari was able to train Tokuchi less and less due to the coming battle in winter. The circumstances and scale of the battle was explained to Tokuchi by Halibel after he inquired about it. Once he understood, Tokuchi knew that he would most likely die if he were to join in. Plans changed swiftly however when the female human named Orihime Inoue was brought to Hueco Mundo. Tokuchi knew this would spell chaos. The winter battle would come much sooner now. He figured it to be best to leave Las Noches right then, which is what he did. He returned to the Menos forest, hearing from the other Arrancar about packs of Adjuchas that roam around. Tokuchi set out to find them, killing Hollow and Menos alike.. Whatever he happened to see on his way through the decrepit area. After quite a bit of traveling Tokuchi found his first Adjuchas in the forest. It was a powerful one, yet it had quite a slow processing speed. Tokuchi deduced this after following it for a couple hours and decided to strike, moments after the large Adjuchas was lifeless on the ground, his soul being consumed by Tokuchi. He could feel the power of the brainless brute coursing through him, but Tokuchi was hardly satisfied. He continued to roam the Menos Forest until he stumbled upon a campfire, surrounding it were several Adjuchas. It was just as the Arrancar's depicted, Tokuchi stood atop a tree and surveyed the group, noticing that every now and then one would go off and look for food. Tokuchi took advantage of this pattern and slew the group individually. Tokuchi finally felt it. It was like a fire that had ignited in him. He was close to achieving his full potential. It was then that Ichigo and company arrived to Hueco Mundo, their point of entry happened to be the forest of the Menos. Tokuchi sensed this and went into hiding, climbing to the top of the forest and remaining there as the small group plowed their way through, watching as they continued to advance towards Las Noches. "Loyal I will be, a martyr I will not..." Tokuchi sighed to himself, he was sure this would mean certain death for most of the Arrancar. With this in mind, Tokuchi simply stayed in the forest and offered no assistance, he wouldn't think to try and stop them, not after hearing about what happened to Grimmjow. The days passed and Tokuchi monitered their progress from afar, sensing the Espada fall one by one he let out a sigh. Finally, the battle of Las Noches had ended and the grand citadel was lost to the Shinigami invaders. Tokuchi made his way back to the ruins of the great establishment to find Zommari in his released state, immobile and barely breathing. Tokuchi knew what he had to do to become a Vasto Lorde. "I'm sorry old friend, but you will live on in me..." With that, Tokuchi bit down on Zommari's neck and sapped the remaining life out of him. The transformation was instant. Tokuchi's body reformed, his armor thickened, his wings relocated to his waist and the back of his hands, the helmet of a mask now completely covered his head, though it would be short lived.. Tokuchi pried the helmet off and began to change yet again. To his surprise, his appearance was almost exactly that of what he was before he died, the difference being the earrings he now dawned. As he scavenged Las Noches for remnants of the supreme Arrancar army, Tokuchi stumbled upon an Arrancar with immense powers. He knew the Arrancar had the potential to become a great leader, perhaps even more-so than Aizen. As such, Tokuchi pledged allegiance to the being and in turn became one of the Numeros Arrancar. His number was then engraved on his right wrist. He had settled on the number "37", which he wore like some sort of badge of honor. The stale air cascaded through Tokuchi's hair like a flow of water, bringing with it dust and debris from the vast and empty realm of Hueco Mundo. As the dust-filled breeze finally calmed down, Tokuchi ruffled his hair slightly, brushing out the sand and dust that had accumulated. A yawn escaped him as he leaned back on the large boulder he had been sitting upon. The sound of the hardened skin of his palms clapping against the solid stone echoed into the barren landscape that surrounded him. "Surely there has to be something to do in this wasteland other than laze around all day.. Perhaps I should bring back some board games from the human realm..." Closing his eyes, a smile crept over his face as he tried to imagine the other Espada and Arrancar trying to participate in such a pointless encounter. He quickly stifled a laugh by removing his left hand from the boulder and bringing it up to cover his mouth. After a few moments his chuckle subsided and he slowly leaned forward, pulling his hand away from his mouth as well as the boulder. Tokuchi lifted his arms slightly and leaned forward, his feet sliding off the boulder and pressing into the sand below. He began to stand up, leaving an indentation on the ground below. After standing, Tokuchi began leaning back. Contorting his body until a few pops and cracks emitted from his back, between his shoulder blades in particular. Feeling satisfied, he straightened his stance and lifted his right arm, positioning it in front of him as he snapped his fingers. The area where his hand had been began to distort and separate, causing a rift known as a Garganta. "Let's see what I can scrounge up." He said to himself as he leaned forward, falling into the distorted space. The travel was instantaneous, and Tokuchi began flying down head first towards Karakura, his hands secured snugly in his pockets as he rapidly descended. Just as he came within roughly 3 meters of the pavement, his descent slowly came to a halt as his body floated into a standing position, finally touching down in the bustling city. His feet made a small tapping noise as he landed, the dirt scratching between the pavement and his shoes with an unpleasant scraping sound. From his descent to the ground, he gathered that Winter was approaching, the bitter cold rushed about the air like a ghastly apparition. Shrugging off the cold air, Tokuchi adjusted his shirt and began to stroll down the sidewalk, his arms firmly at his sides with his hands secured in his pockets. As he walked along, his feet rhythmically tapped against the ground. While he proceeded into Karakura, the effects of his Cerebral Sonar were set in motion. He faded into a crowd of pedestrians as he waited for a crosswalk light to signify it was safe to proceed to the next street. By the time he had made it from one side of the street to the other, he was visible to humans and spiritual entities alike; Just one of the perks to his ability. The crosswalk he strolled through led him straight to a “downtown” district, filled with produce vendors, concession stands, gift shops, and more. Tokuchi’s expressions could be comparative to a little kid in a candy store. The stupidest grin was plastered across his face as he bounced around town, checking out vendors and taking in the scenery. Along the way, Tokuchi stumbled upon a large crowd that had gathered in town square, apparently there was some live entertainment that was being held. Tokuchi boldly entered the crowd and his eyes immediately narrowed. His hands raced into the pockets and purses of those around him. The movements were nearly instantaneous and difficult to be seen let alone the distraction that was so graciously presented on a silver platter. After collecting what he believed to be enough yen, Tokuchi took his leave. Pushing through the swarm of people, he tried to slip out with as little contact as possible. An impossible task to say the least. People constantly pushing and shoving to get closer to the stage made Tokuchi look and feel like a fish trying to swim upstream. He grunted as one man’s elbow slammed into his jaw. Where he would normally react by not so politely tossing the man a block in the wrong direction, Tokuchi simply sighed and pushed through the crowd as best he could. Besides, he would be lucky if Tokuchi’s Hierro hadn’t shattered the man’s elbow. A roll of his eyes was all that Tokuchi could offer to the groans of one individual, whose voice was being drowned out by the loud music. Continuing his journey, Tokuchi began to press further downtown. Every now and again he would pop his head into stores to do a bit of window shopping. Unfortunately after about two hours of patrolling the area, Tokuchi was becoming a bit less confident in that he would find the item he’d been seeking. Eventually, as time passed and the congregation of people slowly dispersed, Tokuchi started retracing his steps and entering shops that he had missed due to the vast amount of traffic coming from and going to town square. He stumbled upon a shop filled with baubles and antiques that lined the shelves. Glued to everything that caught his eye, Tokuchi took quite a bit of time inspecting every little item in the store. Finally, it seemed like Tokuchi had found what he’d been looking for. Glaring like a hungry wolf would stare down a fresh meal, he swiftly yet carefully yanked the large glass chess set from the lower shelf and bolted towards the checkout counter. “That’ll be sev-!” Was all the shop owner could spit out before Tokuchi practically threw all of the money he had at the man and trailed out of the shop with an extra bounce in his step. With his product in hand, Tokuchi finally began suppressing his Cerebral Sonar ability. This caused him to fade from the sight of humans. Afterward, he hopped atop the roof of the establishment that he had just emerged from. Lifting his right arm to open a Garganta once more, while his chess set was safely tucked between his side and left arm. As he pressed his thumb and index finger together, his Pesequisa picked up on something. A ravenous Hollow emitting a murderous aura. Narrowing his eyes and baring a fang on the left side of his mouth, Tokuchi began to sonido from roof to roof at an accelerating pace. At this point, he was no longer worried about concealment and would take care of any Shinigami or otherwise that intended to cross him. His feet made no sound as his sonido’s brought him to his destination. Just in time it would seem, as the ape-like Hollow barreled through the small residential area.